Mark Essig was settling into his puddle-jumper flight from Charlotte to Asheville, N.C., on Monday when he noticed an unusual passenger boarding the plane. It was a duck. Making his way down the aisle. Wearing red shoes. And a Captain America diaper. 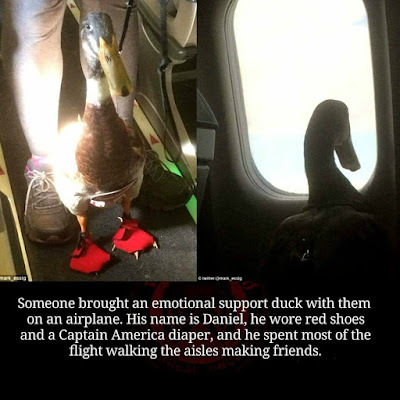 The duck’s human introduced him to their fellow, now-amused passengers: This was Daniel Turducken Stinkerbutt, or Daniel for short. He is a 4 1/2-year-old Indian Runner duck and is her emotional support animal, she explained. Like many other passengers, Essig snapped a few photos while Daniel and his human were boarding. After takeoff, Essig tried to concentrate on light reading during the flight, but he kept inadvertently glancing toward the duck, just a row ahead and to the right of him. When he saw the duck staring out the window, he couldn’t resist taking one more picture. This duck is better at making friends than me. The person that brought the duck on the plane should have been told to get the duck out of here. And after the flight the Chinese passenger decided to take it home, guess what happens next. This is the duck I was telling you about. Adam Corrola has an emotional support pelican who goes up and down the aisle of passenger airplanes "making friends".